There has never been a book solely devoted to rigs until now!! 400 pages of step by step photographs explaining the mechanics of today’s carp rigs, making the most complicated rigs simple and safe , how to tie them with the safety of the carp in mind and how to get the best results once the rig is tied. Every conceivable variation is covered, all the little edges which make the difference are explained in almost forty chapters and then separate chapters on each scenario that we face , be it weed, snags, silt, margins, distance, surface fishing and zigs so you will know which rig to use and more importantly why! 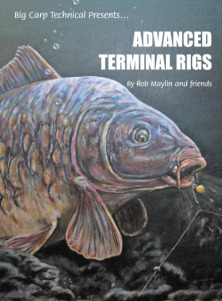 Rob said "Not a beginner’s guide, Advanced Terminal Rigs is the definitive encyclopaedia of today’s hi tech carp rigs, so don’t expect any floating crust or luncheon meat rigs in these pages. There were two main reasons for this book: Firstly to explain in easy step-by-step photographs how to tie all of today’s sometimes overcomplicated end rigs, and secondly, and most importantly, how to tie ‘safe’ environmentally friendly rigs, something that in my opinion was desperately needed in today’s fast fishing carp scene. Anyone can tie a rig but sometimes making it safe for the carp takes a little more care. With this book, complicated rigs will become simple to understand and to tie, and death rigs will be no more! There are a number of writers in this book, each chosen for his particular expertise. I wrote the mag-aligner chapters of course, whilst Martin Pick covered zig rigs, Craig Law divulged his floater fishing secrets, Simon Atkinson takes the strain out of weed fishing, Mick Krassos and Dave Magalhaes covered snags and silt, Matt Eaton covered pop-ups, whilst John Claridge, George Loughlin, Nick Burrage and I covered the rest. Everything from presentation, hook choice, lead choice and hooklink choice are explained in detail with individual chapters on snowman, blowback, 360 rig, mag-aligner, chod rigs, stiff rigs, Withy Pool, 90˚ bead, balanced bait, KD rig, multi rig, combi rig, bottom bait and surface rigs all covered in detail with easy step-by-step photo sequences to make understanding and tying these complicated rigs simple and safe. Then, as if that wasn’t enough, each scenario is then explained further so that all those little tweaks and edges that put extra fish on the bank can be applied."